Visitor Management System in Singapore is a critical component within the suite of security access control solutions implementation in your company. It gives you the ability to know exactly who entered your building premises, when, and why. More importantly, it plays the critical role of allowing you to manage and differentiate between authorized visitors, who should be granted card access and illegitimate visitors who should be denied entry. 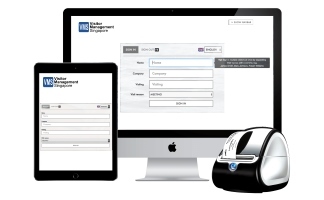 The use of such a system products is the key to greater information view visibility by helping you to register, facilitate and monitor the entire duration of every single new visitor’s visit in the company, from the initial check-in registration process, right to the departure of the visitor when his appointment has ended. Typically on any given day, small businesses and companies in Singapore receives a diverse array of visitors, ranging from 3rd party vendors, service support contractors, family members, volunteers, courier delivery personnel, customers, business associates, overseas colleagues, staff, guests, government officials, competitors, and many other temporary groups of unknown people who do not have a prior appointment with anyone in the company. This gives rise to the urgent need for a visitor management solution to effectively authenticate and pro-actively monitor the people coming in and out of your business on a daily basis, as you cannot foresee with absolute certainty where your visitors will go and whether they have any malicious intent. With the rapidly evolving security landscape over the recent years and rising incidences of unconventional threats of terrorism to homeland security, businesses have to stay vigilant to constantly identify threats, keep up with the ever evolving security threats. Any exposure to security design vulnerabilities has to be addressed and mitigated with a visitor pass management system to prevent any costly financial losses from any criminal acts, such as theft of company intellectual assets, or injury of staff within your organization. A visitor management system is a more secure visitor identity management solution compared to the traditional visitor log book. By having the visitor’s information seamlessly and electronically captured, it helps to keep visitor’s information confidential from other guests, unlike in the guest log book, where the manually handwritten private information by the previous visitors are exposed to other visitors to see. Serious problems can arise in situations, where perhaps, names of past visitors, suppliers or customers are exposed to visiting competitors, thus jeopardizing the company’s business operations. Base on your needs, the Visitor management system can be fully integrated with various access control hardware system, to grant visitors with a temporary and limited card access rights. Apart from human visitors, our visitor management software system can also be integrated to support and work with a vehicle access control system, such as an electronic parking management system. For added security, to prevent abuse of the visitor access pass, the visitor management system can detect and alert you to any denial of entry status if the visitor is attempting to gain access to restricted areas within the building using the issued visitor pass. Base on your user needs, integration with Time and Attendance Software can also be configured to enable the visitor management system to automatically track the time in and time out of both your employees and visitors. This integration with time attendance functionality of the access control system provides staff with a single card solution, whereby it enables staff to self-check in and check out of their attendance using the same RFID employee smart card. As your business grows, and demands from you a greater amount of your time and attention, managing and keeping track of the punctuality and daily attendance of your team can be a real challenge. With the time attendance functionality of the visitor management system, you can easily capture and record the hours clocked for each appointment in your company by getting your staff to simply clock in and clock out by tapping their employee ID smart card. This gives you a convenient and not disruptive way to monitor and account for your team’s attendance even while you are on the move and not in the office. An added benefit of this is that it also helps you to ensure compliance with labor regulations and policies. Impress your visiting potential customers and business partners with a streamlined, swift, and easy visitor check-in process, which helps to gives a good 1st impression. Imagine your staff and visitors simply have to tap on a professional-looking tablet in-order to get registered. 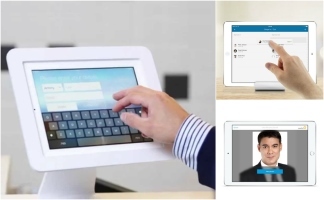 This high tech visitor management solution product will definitely be able to help to give your business a professional look. Typically when a visitor arrives at the offices for a meeting, they would be asked to fill in details of their personal user data in a visitor book (such as Name, Company, Time & Date of visit, and Purpose of visit). This often involves the visitor manually entering them the information by writing on the visitor log book. Often this information is not verified and could very well be false information for all we know! Imagine a scenario where this visitor customer is able to see all the exposed confidential information of the past visitors, some of which are perhaps your existing clients while filling up the visitor book log book. You only get one time to make a good 1st impression, and this definitely does not present your company in a very professional light. From a safety point of view, a visitor management system gives you a way to efficiently record who’s in the building facility so as to protect their safety by accounting for their presence in the event of an evacuation. During an emergency evacuation, such as a fire outbreak or blackout, the software can be used to instantly generate a detailed evacuation name list to facilitate in the roll call process to ensure that both employees and visitors are all evacuated safely and account for. As an optional security screening feature in the event of a flu virus season, or outbreak of contagious disease, we have the capability to integrate a temperature input devices, such as IR camera to measure and track the body temperature of all visitors coming into the building site premises. This helps to give you the ability to detect any visitors with fever, which could be a symptom of a virus infection. In such a scenario, a visitor management system plays a crucial role as the first line of defense to protect the company against any loss of workforce productivity and loss of work hours, due to a flu infection among its employees. With a visitor management system, you can quickly identify registered guests and securely keep track of who is on your site facility at all times. For a secure authentication, biometric readers can be integrated with the system to capture the visitor’s biometric credentials, such as their fingerprint or facial features. The system is also equipped with a badge printer so that your front desk staff can print visitor pass quickly. Normally when visitors get checked in, paper visitor log book is used to collect the visitor’s details, such as Name, Purpose of Visit, Company name, and Host department. As this information is manually self-handwritten by them, the records in the visitor log books are often filled with illegible hand scribble which is hard to read. In some serious situation, it is totally possible that the information provided by the guest is false since the information provided is self-declared by them and unverified. As a result, this effectively allows an unauthorized intruder to gain unrestricted access throughout your building facility! When managing visitors, the reality is that sometimes there are people that you just do not want at your facility premises for a wide variety of reasons. This may include reasons such as people with protection orders imposed against them, people with custodial agreements where they do not want specific parent from picking up their children at school. When a banned visitor shows up to the office building, it is often the case that they will attempt to enter and be granted access by not revealing that they are in fact actually banned. To the front desk staff, there is no way of knowing a visitor is banned simply by facial recognition or memory recall. This is especially so when your front desk service staff are contract staff or when they have to manage the registration of hundreds of visitors on a daily basis. Visitor management system has a built-in banned visitor screening feature functionality which provides your organization with an added level of security. It helps to track and prevent new visitors who should not be allowed entry from being enrolled into the system. It works by ensuring that all visitor information captured is cross referenced with an internal web database of banned visitors. In the event that there is a match, the visitor management software will automatically deny the banned visitor from being enrolled into the Visitor management system. The visitor manager software will also show a pop-up box mobile notification which alerts the front desk security officer that the visitor has been banned. This enables the immediate activation of security staff to handle the situation, thus protecting the safety of the front desk staff. In addition, the system also allows you to be able to keep track of the history of other instances where they showed up at the building, and show the specific reasons on why they are banned in the past. One of the primary reasons Identification and tracking of visitors have to be carried out is because of the need to safeguard the security of your company. To prevent the theft of intellectual and physical assets, or sabotage, a visitor management system can be the 1st line of defense to guard against any potential intrusion by an external visitor. For premises which are of high-security clearance, the visitor management system can also serve to enforce on the visitors the surrendering of their camera phones or removable storage devices to prevent the theft of propriety company information. To Safe Guard the Life Safety of your Employees within your Organization. Your employees are probably your single greatest asset. In the event of a successful intrusion by an unauthorized personnel with malicious intent, it can potentially expose your employee to unnecessary danger. Especially in recent times, where threats of terrorism to homeland security are more real than ever, safe guarding the life safety of your human asset is an urgent area of security that must not be ignored. Having a visitor management system helps your organization to meet the increasing need for proper documentation, and ensure regulatory policy compliance. To ensure that your company engages 3rd party service contractor workers that are legally permitted to work, the visitor management system is able to track and cross check expiry dates of work permits with an internal database to ensure their validity. Any work permits that is expired, or are nearing their expiry date that is detected will trigger an alert notification, thereby ensuring that your organization is compliant with labor regulations. 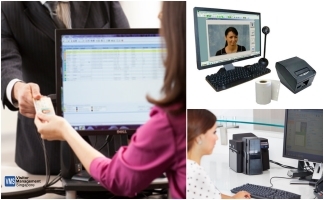 A VMS system helps to automate and streamline the visitor registration process for greater speed & efficiency. Details on visitor information can simply and easily be electronically captured quickly into the visitor database just by using a dual-sided scanner with Optical Character Recognition (OCR) or barcode scanning on common identity credentials, such as NRIC card, work permit pass, and driver’s license. As the information is securely retained in a central visitor database, the regular visitors will enjoy an even faster verification process next time he/she visits again. For added security, webcam and CCTV video module options can be integrated with the VMS system to automatically capture and record the visitor’s facial image when they visit. The automation of the visitor management and tracking process enables visitor details to be captured within seconds, thus significantly helping you to shorten the visitor wait time. With a VMS system, you are able to know exactly who has entered and departed from your premises at any given point in time. The visitor management software features a database Search and retrieval function, which has easy search filtering options, that allows you to filter base on Name, time and date of visit, organization, host name, host department, and purpose of visit. It is also able to generate statistical reports on visitor logs to give insights and details on useful information, such as the distribution of the visitor profile, time of highest traffic etc. With a visitor management system (VMS), you are able to quickly generate a visitor report and know exactly who is in your facility in an event of an emergency. For example, in the event of an evacuation during a fire outbreak or power outrage, the safety officer overseeing the evacuation is able to instantly know who exactly is in the building facilities, and check if they have evacuated. In this aspect, a visitor management system can actually save the life of the visitor trapped in the building. Unlike outdated paper based guest and visitor log books which do not provide enough detailed visitor information, and are often filled with fuzzy handwritings, a secure visitor management solution, offers you all the advantages that a paper guest book do not offer. With a Visitor Management system, you able to enhance your visitor check in efficiency where you get to scan an Identity ID card to register a visitor, capture detailed information, print the badge pass and notify the host employee of the guest’s arrival within seconds notice. Obtaining and validation of the visitor’s credentials, usually via NRIC identity card, Drivers License, Employee RFID Smart card, or Work permit. If needed, credentials can be cross check with an existing database to validate certain passes, such as a service provider’s work permit. For a higher level of security screening when entering a sensitive area, visitor information collected can also be cross checked with a database of blacklisted visitor details to anticipate detect any potential intruder. The visitor is then issued with a professional visitor ID badge, or self-expiring ID tag so that he/she is easily identifiable in the facility as they work down the hallway. During the entire duration of the visitor’s visit to the organization, the VMS system checks to ensures that the visitor adheres to the scheduled appointment time. In the event that the visitor has finished his/her appoint and is still present in the office, the visitor management system will notify the security command center and concurrently issue an SMS reminder to the visitor to leave the premises. After a successful visit, the guest pass will be returned to the receptionist and the visitor is checked out. After the visitor has been enrolled into the system for the first time, the visitor details are the securely stored in the database, so that next time the visitor visits again, they can simply sign-in themselves by scanning the visitor pass which was previously issued to them.